Meet ‘Rod The Bod’ — a rippling 100kg forward with Papua New Guinean blood who idolised Gorden Tallis and now hopes to be the Broncos’ new-age Raging Bull. You may not have heard of Rodney Griffin, but the stocky forward could soon be an NRL cult figure after being offered a pre-season trial by Broncos coach Wayne Bennett. At 178cm, Griffin is not the most imposing figure in rugby league. But with one of the lowest body-fat readings at the Broncos and a physique as rock hard as the mountainous terrain of his PNG homeland, Griffin offers an X-factor that appeals to Bennett. While many Broncos colleagues have huffed and puffed in pre-season, Griffin has rocketed into NRL contention with his ability to power through punishing two-hour sessions. The 27-year-old was a revelation for Intrust Super Cup side Ipswich last season, regularly playing 80 minutes up front, with Jets co-coach Ben Walker rating Griffin the best forward outside the NRL system. 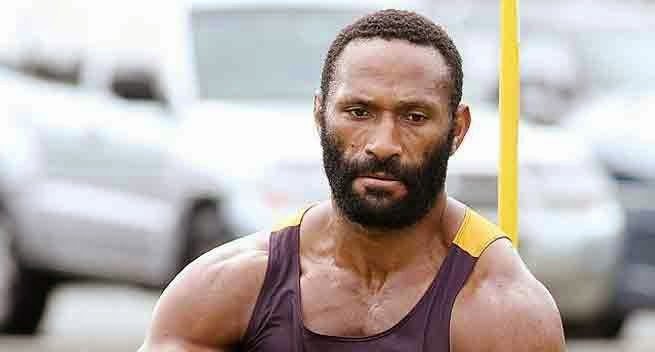 The PNG international trains with the Broncos once a week but is hoping a bumper pre-season will see him clinch the Brisbane jumper once worn by his boyhood idol Tallis. “I’m training all the way through to the trials and if I get a shot in the NRL that would be great. At this stage, I’m just doing what I’m told, that’s good enough for me,” Griffin said. “As a kid, I loved the Broncos and I looked up to Gorden Tallis. I liked his aggressiveness and his presence on the field. The time he dragged Brett Hodgson over the sideline (in State of Origin) ... he was the pinnacle of the back-rower. If anyone deserves an NRL contract, it is Griffin. Born in PNG, he moved to the north Queensland town of Atherton with his parents at age three and has faced a multitude of setbacks chasing his NRL dream. In the past decade, he has had stints with Wests Tigers, Canberra, Wynnum Manly, Northern Pride and Tweed Heads, but his move to Ipswich last year took the workhorse to a new level. “I have lost 10kg training at Ipswich,” he said. “I have got fitter, sharper and more mobile. Humble and likable, Griffin jokes he is partly terrified of Bennett. “I just see him ... He’s Wayne Bennett so you can’t say much too him,” he said. “He came over and had a chat to me one day and I was like yep, yep, I didn’t know what to say to him.